Mumbai, Nov 5 (IANS) Megastar Amitabh Bachchan has sung a few lines of a lullaby for the forthcoming film "Thugs Of Hindostan". He says he was excited to sing it. "The song tells you the depth of the bond that Zafira and Khudabaksh share. I was most excited to sing this lullaby because it is not everyday that you get to sing one," Amitabh said in a statement. "The lyrics are beautiful and the composition highlights the emotional journey of these two characters who have an incredible father-daughter relationship. I have been telling Aditya (Chopra) to put this in the album. I'm sure he will do it because it's turned out to be a beautiful song," he added. According to a source associated with the film, the film's director Vijay Krishna Acharya wanted to show a beautiful father-daughter like relationship between the two that develops ever since Zafira was a child. "He wanted to show the deep trust, the love and the respect that Zafira has for Khudabaksh and decided to add a moment of vulnerability between the two. Khudabaksh will be seen protecting Zafira at every step and they are inseparable souls." 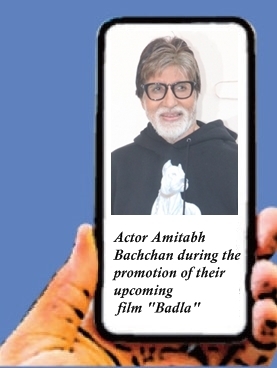 "Mr. Bachchan was so kicked about singing this lullaby that he decided to record it himself and that too at his home! The initial idea was to make a short lullaby but Mr. Bachchan went a step further and converted it into a song. He is insisting that Aditya (Chopra) puts it into the album," the source added.